sky as it infuences the tides and may govern unkown aspects of our day-to-day lives. and effect that makes spellwork possible. first quarter (also known as half-moon), full moon, and third quarter. represents the feminine, mystical side of our nature. 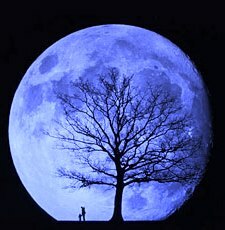 The moon is a symbol of the goddess. female monthly cycle that controls human fertility. first in the cycle. Seeds planted at this time will manifest more quickly. This is a good time for building up strength, manifestation, expansion and growth. This is the time the energy of increase is at its high point. Use it for expansion and growth. manifest spells begun at new moon. meditation and study. 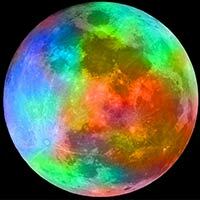 Use this moon's energy to banish harmful energies. The moon rises around sunset when it's a full Moon, and sunrise when it's a new moon. 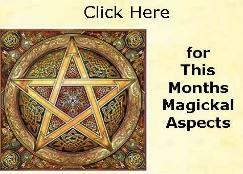 through can be used to good advantage during spellwork. matters of self and your personality. nature, vehicles, benefits and possessions. and uncrossing spells. 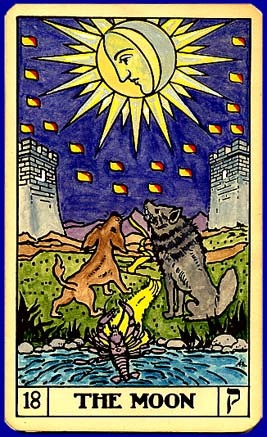 Be careful the moon in Gemini can be unpredictable and unstable. concerns. Can also be used for matters concerning the end of life. Moon in Leo- Spells involving leadership, prosperity, fame and career are best done in Leo. entertainment, sports and your pets. environment, health, service extended or clothing. for spells involving legal matters and small animals. distance travel, in-laws and higher learning. for setting boundaries. Also business, career, reputation, fathers and honor. involving friendship, acquaintances, hopes and dreams, groups and organizations. communication with spirits. Inner development, karma, restrictions, secrets revealed.